It’s been a while since I’ve showed you my current work. A couple of weeks ago I finished binding a project started last year. It was the one that made me tear my hair out, along with thousands of quilting stitches. It’s finished, but it’s for a loved one and I’d like to get it to her before showing it off here. Just in case. If you’ve been a reader for a long time, you may have noticed (or seen me write) that I often don’t post about projects in their early stages. Mostly that’s because I don’t much like taking pictures, and it’s hard to describe a project without them! The project I’m working on now is much the same. I actually started it months ago, and now finally am getting around to posting. This time, however, it really still is in the early stages. I began the flying geese as I finished making Union. As mentioned before, I was still enjoying the double pinks and browns, and I wanted to combine them with reds, aquas, and teals. Since the fabric was still out, I started cutting pieces for the four-at-a-time method of making geese units, but I didn’t start sewing them until this year. I’m not sure what inspired me to make a medallion with a house center block. I’ve always been charmed by folk art including early American embroidery samplers, which often featured houses or school buildings. 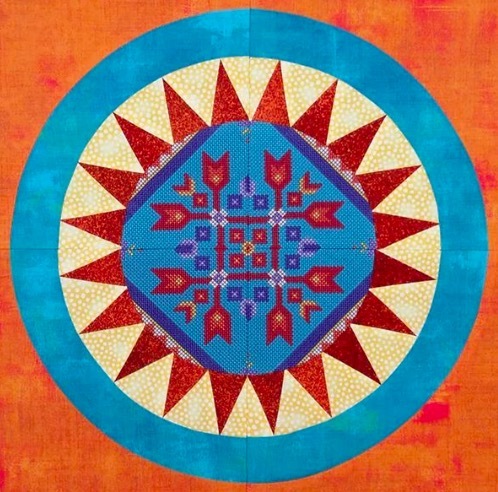 Recently Barbara Brackman posted about quilts with yellow house motifs. Maybe that got me going. I also had a hard time imagining the strip quilt I originally intended. I couldn’t figure out the numbers of strips or what, besides the flying geese, to use. It seemed like it would be a lot more piecing than I wanted, and perhaps without a good enough payoff. At any rate, I drew that house. 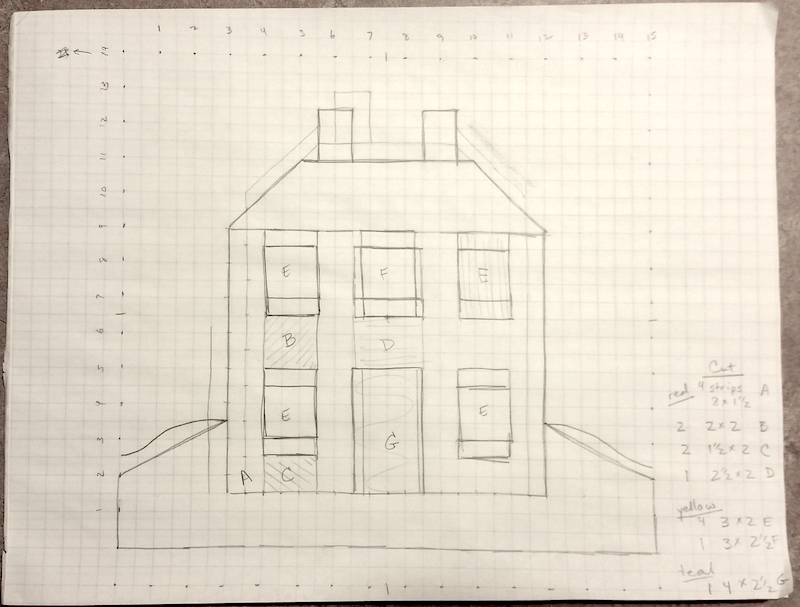 Sometimes the easiest way to do things is the old-fashioned way, and here graph paper and pencil worked just fine. I’ll show you what happened from there next time. Before that, the title of this post might merit some explanation. There IS a lot of fun stuff going on, which is good, since one of my primary intentions this year is to have fun. I’ve had lots of RPT (Real People Time) already this year, and a lot more coming up. On Thursday I’ll have lunch with a dear friend from grad school. She and I lost touch several years ago, and it will be a treat to catch up. I’m also doing things in my non-guild quilty life that are new and different, but things I’ll wait to explain. Could be a crazy year with that, too. I updated the blog a bit, gave it a little fresher look. My galleries are finally up-to-date, after languishing without much care for too long. And then the other personal stuff, including travel coming up. We have four trips pegged already this year and forgive me for hoping that’s all we do! But really, Son’s wedding? FUN! Granddaughter’s graduation? FUN! And a couple of trips for fun? FUN!! Okay. That’s enough for this time. I’ll show you more of my house project in the next post. This entry was posted in Medallion Quilts, Quilting and tagged Center block, Fun, House medallion, Process, Progress, Real People Time, RPT, Work in process on January 24, 2018 by Melanie McNeil. My medallion class began last week! In class I help lead participants through the process of designing their own medallion quilts. And while they create, I do, too. In the few weeks we have together, while each of them is making one quilt, I design and construct two. I start with very different centers and color schemes in order to demonstrate a variety of strategies. The first one I began has a center block that features flying geese circling a star. The block design came from the Big Book of Scrap Quilts, published by Oxmoor House in 2005. The quilt pattern is called “Dizzy Geese,” designed by Joan Streck. 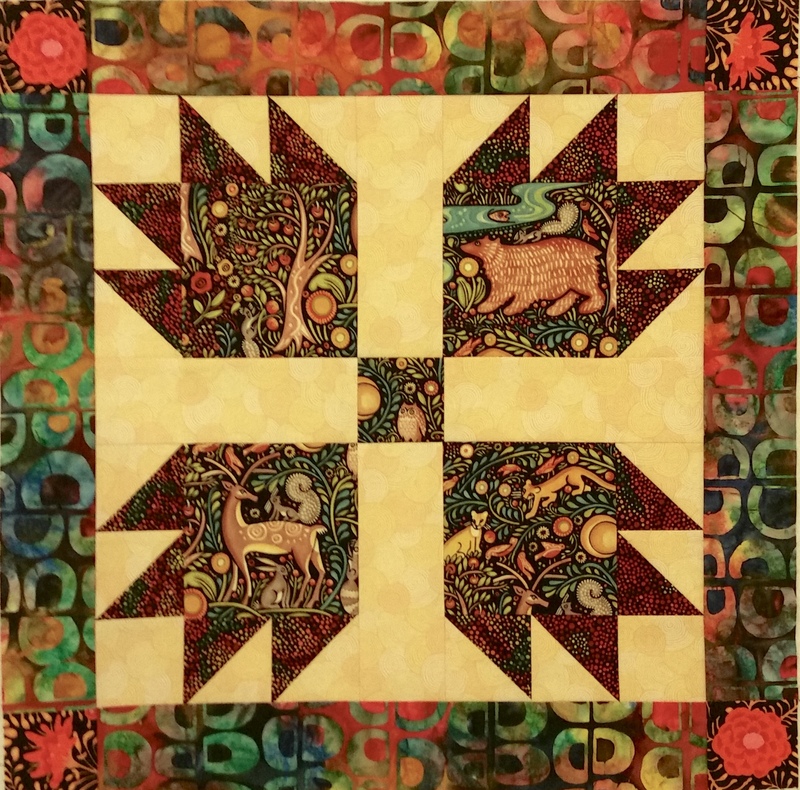 Dizzy Geese is a block quilt, with a 17″ block made with templates. I re-drew the block to 16″ and paper-pieced it. Though I’ve made quilts in reds and greens before, I haven’t made one I’ve thought of as a Christmas quilt. This one will have that intention, but I’d still like to keep it lighthearted. I’ll minimize the holiday-focused prints, but refer to the occasion through shaping. For instance, the circling flying geese give the impression of a wreath. With the intricate center, I wanted a simple first border, but one that would extend the range of color. Because the star points are a forest green print, I chose a citrus green for the border. The corner blocks add to the gold, found in the center’s green print and in its background fabric. The second border was fun and easy to make. Take a look. The corners are just half-square triangles. The side blocks are each made of three pieces and all the blocks are same. Their orientation gives the look of a twisting ribbon as they circle the top. And the third border is a plaid with dark green, dusky gold, and burgundy, with bright gold corners. I don’t love the dark plaid, for various reasons. But I think it will serve its purpose as the design develops. 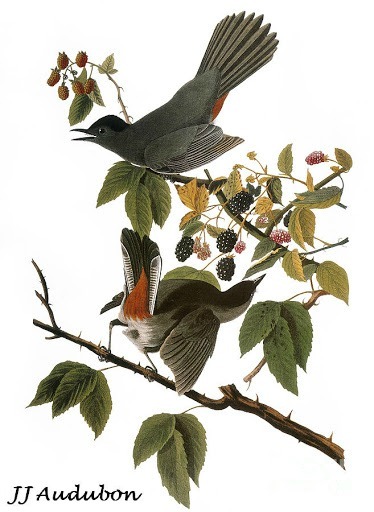 It’s easy to get hung up on individual elements, such as the color or shapes or value of a particular border. Just as you don’t have to love a particular block to have it work well in a block quilt, you don’t have to love a particular border in a medallion quilt. Every border changes every border, and it’s the final effect that counts. I have tentative plans for the next borders, but won’t work on this more until next week. This entry was posted in Medallion Quilts, Quilting, Quilts and tagged Bear's Paw block, Center block, Christmas quilt, Classes, Process, Progress, teaching, Work in process on October 8, 2017 by Melanie McNeil. Friday Jim and I drove down the Mississippi River from La Crosse, WI. We were returning from a two week trip to see our son, who lives in Washington state. With 2,000 miles behind us on the train, it felt great to switch to our own car. In Prairie Du Chien, WI, we stopped for lunch. On one wall of the diner hung a quilt with a patriotic theme. It was a medallion quilt, centered by a stylized American flag. The flag block was turned on point twice, emphasizing its importance and creating a nice, large center. I liked the setting, and especially liked that a non-square rectangle was turned that way. It’s a setting I haven’t used myself. But I’ve never written about turning a larger rectangular block twice. Here are some cool things I learned about it. 15” x 1.414 = 21.21”. 21.21” x 1.414 = 30”. 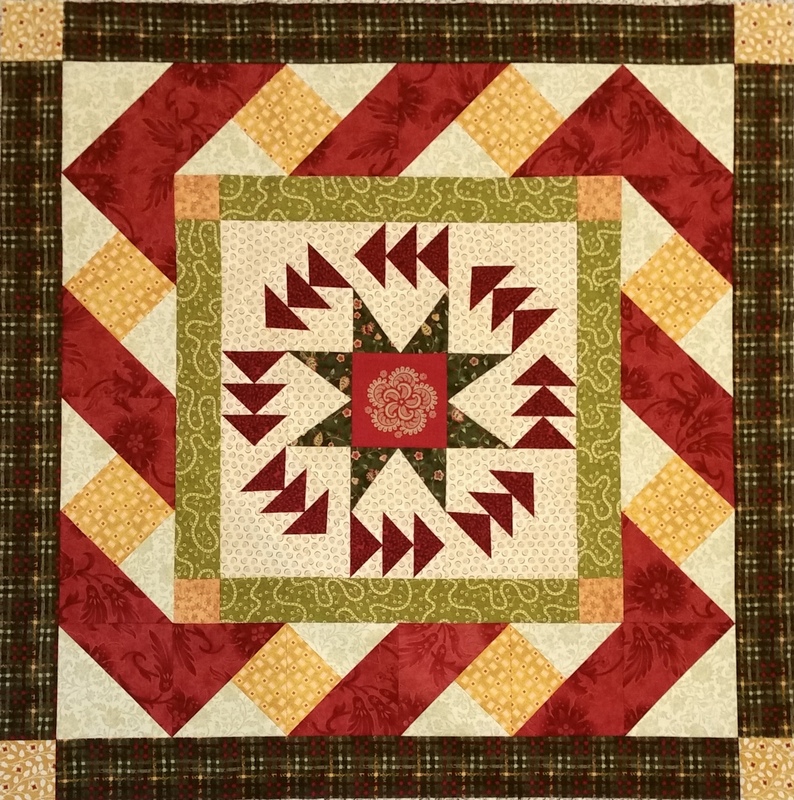 This block setting is often called an “economy block.” It’s an especially effective way of highlighting a small centerpiece, such as a special or fussy-cut piece of fabric. Economy block setting – a square turned on point twice. As it turns out, you can do this with non-square rectangles, too. 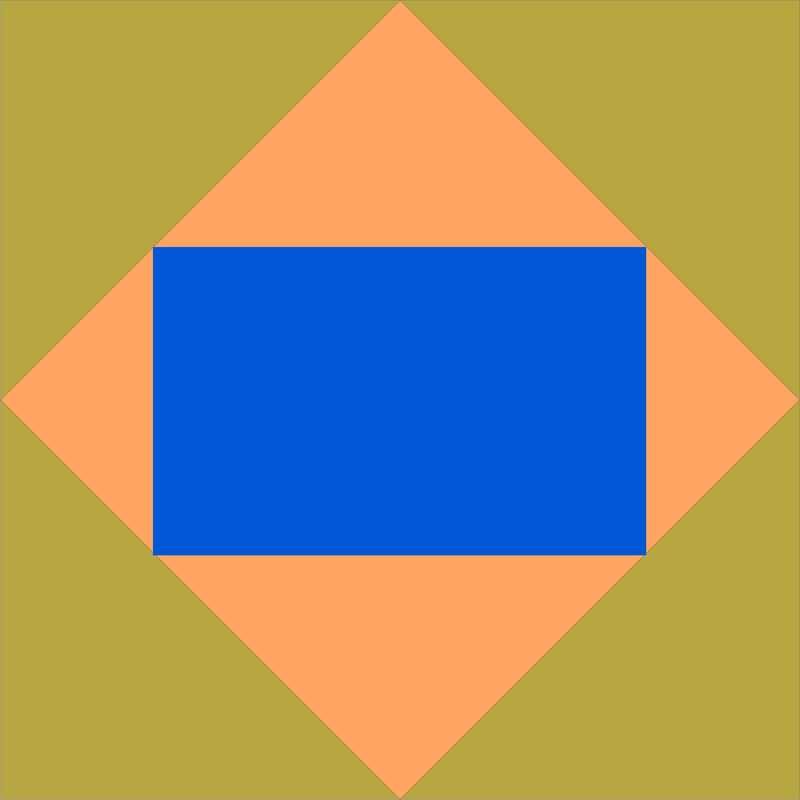 Non-square rectangle, squared first with unequal triangles, and again with equally-sized ones. The size relationship for both types of blocks can be generalized, and is far easier than multiplying by 1.414. 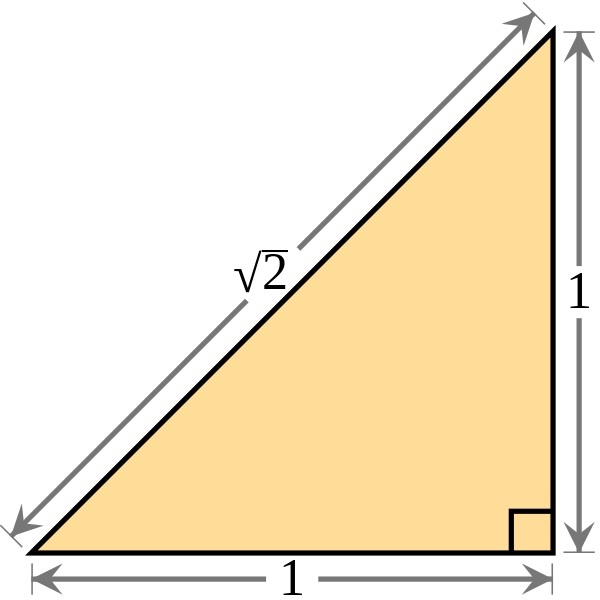 If the length of the inside shape is A, and the width of the inside shape is B, the distance across the diagonal of the interior square is A+B. That means the length of the exterior square is A+B. In the economy block example above, the interior square is 15”. The resulting block is 30” square, or 15” + 15”. the resulting block is 30” square, or 12” + 18”. The next time you want to frame a rectangle with setting triangles, remember how easy it is to determine the finished size. Length plus width of the interior rectangle (square or not!) 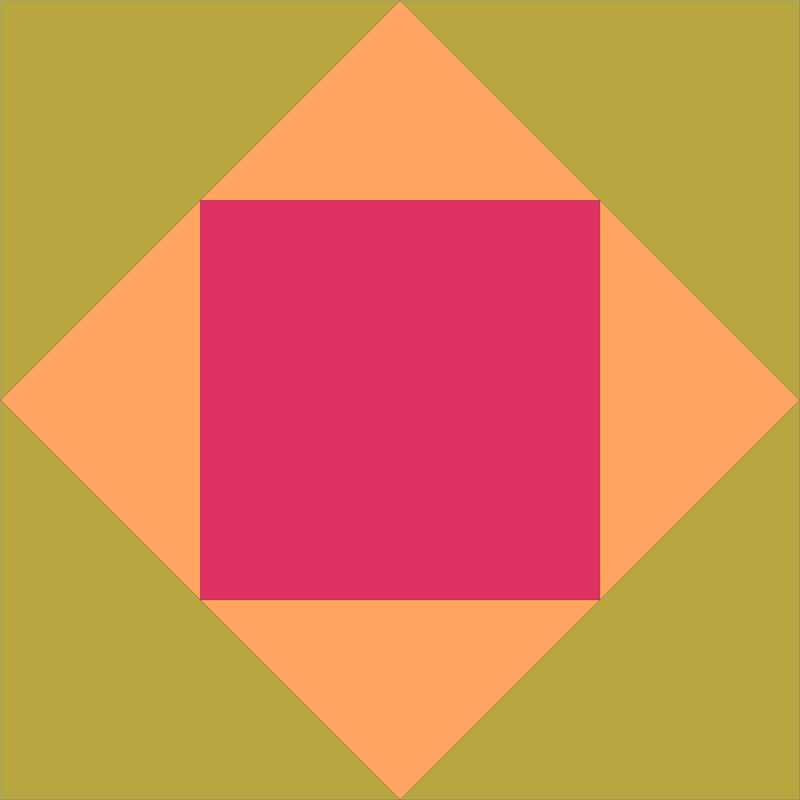 is the width of the resulting square. 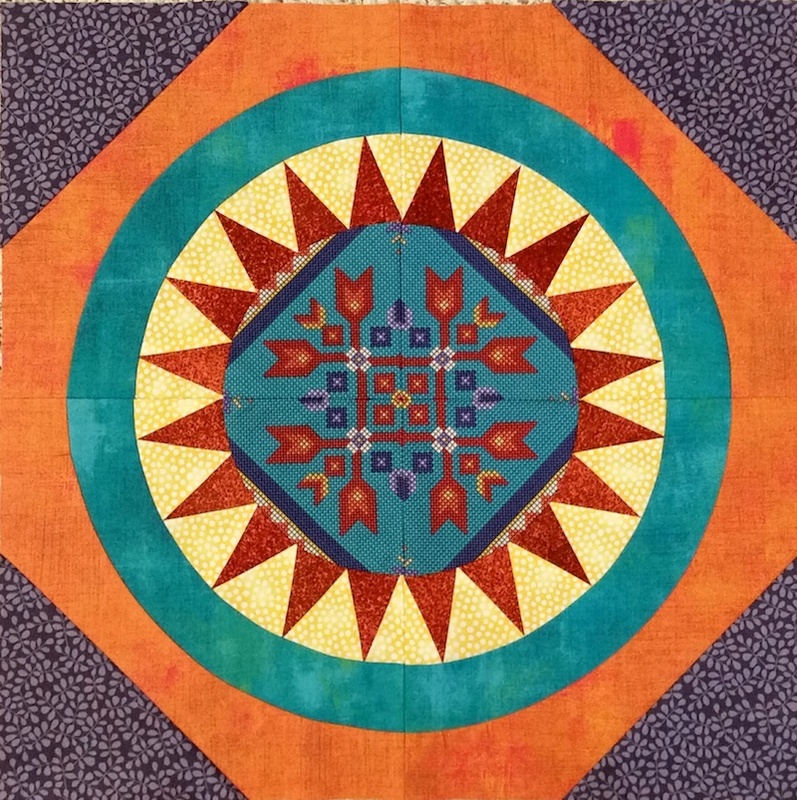 This entry was posted in Medallion Lessons, Medallion Quilts, Quilting, Tutorial and tagged Center block, Economy block, Economy blocks, Quilt math, Tutorial on September 30, 2017 by Melanie McNeil. Each year my local guild has a new challenge, and I’m excited about this year’s! The current challenge is to create a medallion quilt. Though I won’t enter, I’m looking forward to seeing the entries and hearing from members as they create their pieces. We just started our guild year this week, and it will close out in July with display and judging of these quilts. To help my fellow members move through the process, and also to help and inspire others who want to make medallions, I’ve decided to republish some of my prior posts. The best place to start is the beginning, right? Below you’ll see the fundamental rules of making a medallion quilt. This entry was posted in Creativity, Medallion Lessons, Medallion Quilts, Quilting and tagged Borders, Center block, Experiment, Fear, Fear of failure, Fun, Medallion quilt rules, Medallion quilts, Quilt borders, Quilt rules, Rules on September 13, 2017 by Melanie McNeil.